Never Underestimate the Power of the Package; Are You Due for a Redesign? The Winter Fancy Food Show starts in two days. During the past few weeks I have received many sneak peaks of food and beverage innovations to debut at the show. Many product descriptions sound enticing, and then, yikes, I see a photo of the packaged product. It’s truly amazing how so many innovators think so little of the package. Today’s innovators have these great new product concepts. These are products they are passionate about and consume their life. (Think Shark Tank.) Then they package it in a low-quality, generic container with non-descriptive graphics. Repeat after me: The package is the first thing the potential customer sees. It’s the first step to a sale. You must make package selection a priority. And when possible, make the package work for the product. When I was in research and development at Kraft more than 25 years ago, the 3 P’s of innovation—product, process and package--were the foundation of every project. All three departments worked together from concept to execution. Make package development part of your first day of innovation. 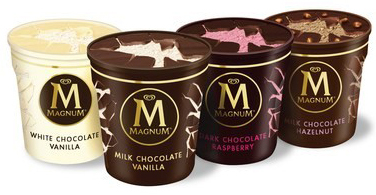 At the beginning of February, Unilever will roll out Magnum tubs to the U.S. market. This product made its global debut this past October in select European markets. It is one of the best examples ever of having the package work for the product. Until now, the Magnum brand was limited to premium stick bar novelties. These ice cream bars were known for their signature crunch as one bites into the outer shell of exquisite chocolate. The company believed it was important for the consumer to experience this interaction in a tub container. This new concept takes the signature Magnum chocolate and silky ice cream from the classic bar and reimagines it into a scoopable format. This first-of-a-kind indulgent ice cream experience relies on the internal sides of the Magnum tub to be encased in a shell of chocolate, which preserves the iconic chocolate crack that ice cream lovers hear upon biting into a Magnum ice cream bar. 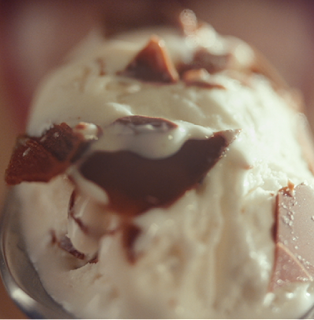 The consumer squeezes the sides of the tub to crack the chocolate shell and then break into the top thick chocolate layer, for the perfect mixture of rich chocolate shards and silky ice cream in every spoonful. The four varieties are: Dark Chocolate Raspberry, Milk Chocolate Hazelnut, Milk Chocolate Vanilla and White Chocolate Vanilla. One must never forget the purpose of the package, as I explained to attendees of the inaugural Frozen Dessert Conference sponsored by the University of Wisconsin-Madison Department of Food Science this past October. The purpose of the package is to contain, protect product, distribute, merchandise, showcase, protect consumer with tamper evident feature, and allow the consumer to store and use as needed. But it can do more. Size: 10-, 12-, 14-, 16-, 32-, 48-, 64-ounces or ??? Extra functions, e.g., easy open, tamper evidence? Influencing the answers to these questions will be decisions regarding graphics and brand identity. Clearly Magnum’s message is premium indulgence, unlike anything you ever experienced before. This past fall, with the competition growing from national and regional competitors, United Dairy Farmers (UDF) decided to redesign the graphics on its ice cream packaging. The goal was to communicate the unique emotion of the brand’s story. “We needed someone who could translate the pride we have in our legacy brand to a complete redesign that conveys our commitment to producing the best ice cream for our customers and making it relevant to a new generation of families,” says Brad Lindner, president and ceo. After an extensive strategic visual audit, Perspective: Branding revamped the UDF’s Homemade Brand line starting with a new distinctive identity: the image of a father and son gazing out to the future sitting atop the brand name. “We are paying homage to the wholesome values and family history, the passing of the baton from generation to generation,” Thorneycroft adds. The design includes a white contemporary font with a twirl in the letter ‘o’ on a solid black rectangle, which represents the creaminess and the act of mixing in all of the quality ingredients. Photography of a luscious and large ice cream scoop and natural ingredients used to make the product cues the high-quality ingredients (many of which UDF makes itself) that go into the creation of the ice cream and its’ unforgettable taste appeal. A white marble background evokes a modern kitchen countertop, or a slab where the ice cream is cut, to check for quality and consistency. Each flavor is written on a recipe card to highlight the homemade ingredients and allude to the traditional passing down of recipes. Finally, the lid color was changed from a generic black to a premium gold reflecting both the quality and a cue to dairy. Speaking of colors, here are some generalizations regarding color considerations. Packaging and graphics showcase what’s inside. It gets the mouth watering. La Terra Fina recently did a redesign as well. The goal was to better communicate the real, premium ingredients and fresh flavors in their dips to further differentiate on shelf. Ripe artichokes, deep green spinach, lemons and chunks of Parmesan cheese are among the fresh ingredients that adorn the brand’s new look. 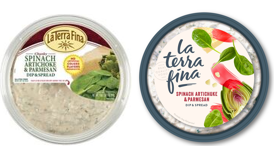 La Terra Fina’s brand revitalization marks a shift for the company to include a food-inspired focus, with a fresh, contemporary and worldly vibe. The brand has a new logo, too, with packaging showcasing vibrant, real food photography that highlights the fresh ingredients used in each product. 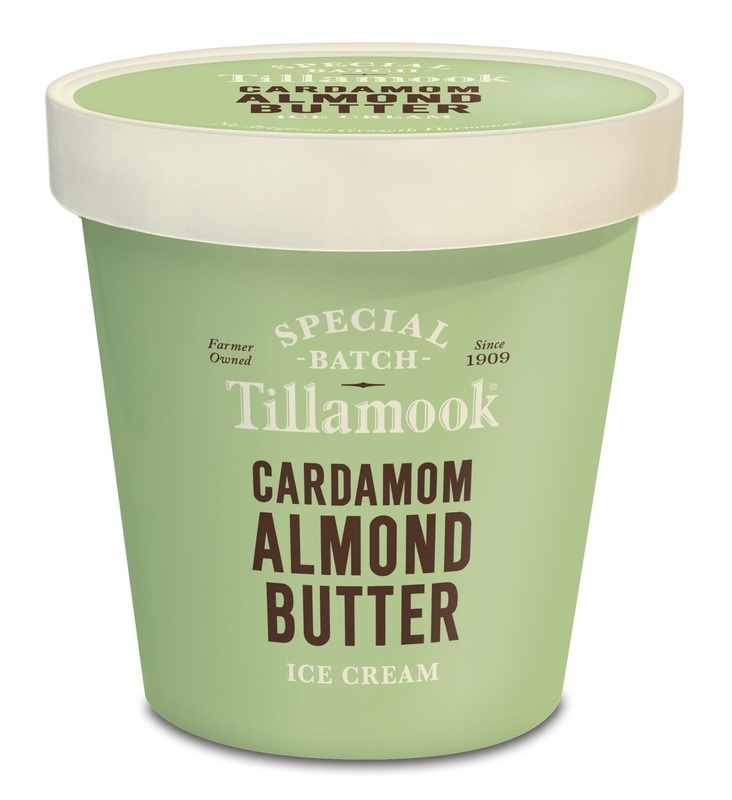 Another ice cream package recently redesigned comes from Tillamook County Creamery Association. The 108-year-old farmer-owned cooperative from the Pacific Northwest has a new look for its superpremium line. The redesign features a cleaner, bold font, and places an emphasis on flavor, with each of the 14 flavors in the series owning a unique color. 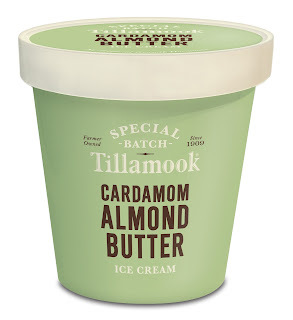 Re-named “Special Batch,” a cream band around the lid ties the entire line together to help consumers identify Tillamook Special Batch items on-shelf. And then there’s Chobani. In celebration of its 10th anniversary, the brand had a makeover. Chobani’s in-house creative team spent more than a year developing the evolved brand look and feel. This differentiates the brand at shelf and reflects its founding mission to provide better food for more people. The brand’s creative expression—Fighting for Happily Ever After—is shaping everything from the brand’s packaging, website and campaigns to its cafés, and more. I love that: fighting for happily ever after. Does your package talk to the consumer? Does it compel them to buy? Maybe it’s time for a makeover. Two weeks into the New Year and I am confident in stating that sugar content will a leading label claim on dairy foods in 2018. If reducing or eliminating added sugar is not a priority for you yet, it’s time to make it one. HealthFocus International reports that consumers around the world have decreased their use of sugar. 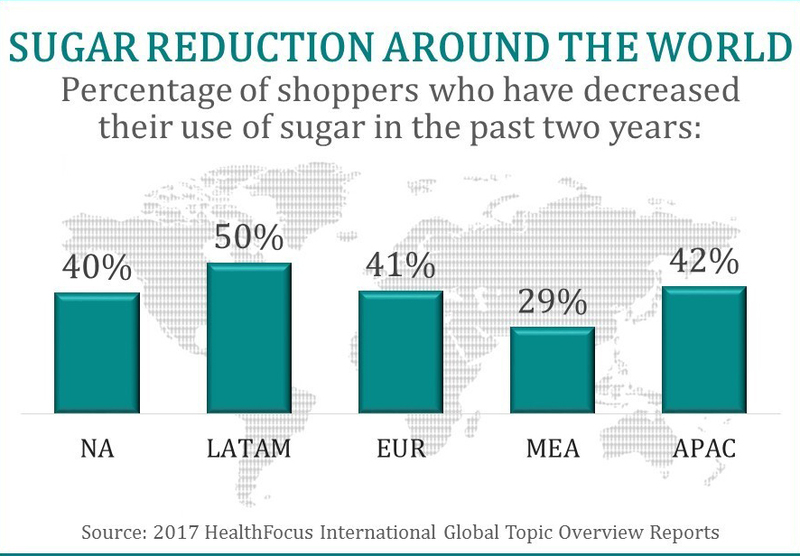 The International Food Information Council (IFIC) 2017 Food & Health Survey shows that the majority (76%) of U.S. shoppers are trying to avoid or limit their sugar intake. They are doing so by eliminating certain foods from their diet. Let’s make sure it’s not dairy. 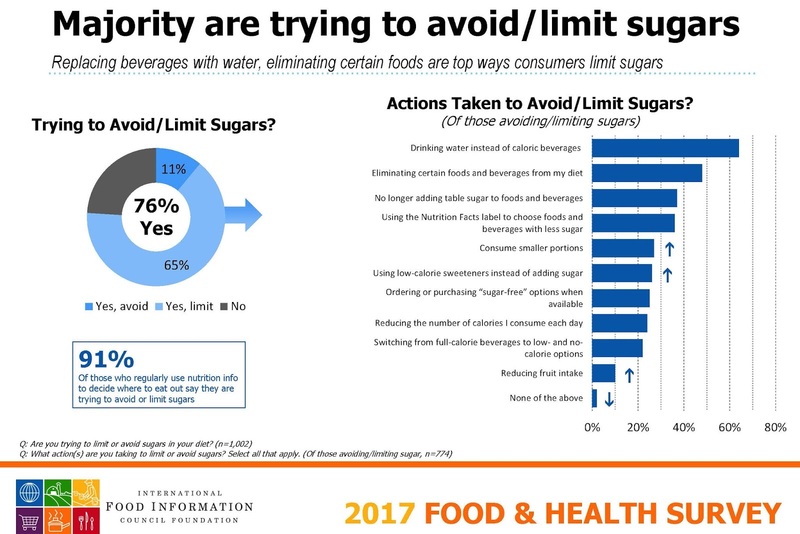 Further, six in 10 consumers view added sugars negatively, according to IFIC research. The dairy industry, in particular yogurt marketers, are responding. Just look at the new products rolling out to assist consumers with their New Year health and wellness resolutions, which for many is avoiding or limiting sugar intake. On January 3rd, siggi’s launched 4% No Added Sugar Yogurt. The new yogurt comes in 4.4-ounce flat containers, with a single serving containing 4 grams of fat, 10 grams of protein, 5 grams of sugar (from the milk and fruit), and 110 to 120 calories, depending on variety. There are two initial flavors. They are: Banana & Cinnamon and Peach & Mango. All siggi’s yogurts are made without any artificial preservatives, sweeteners, flavors or colors. The new product has a suggested retail price of $1.69. DanoneWave is introducing Happy Family Organics branded yogurt. Happy Baby Organics Whole Milk Yogurt is a “baby’s first” yogurt and is described as the “perfect size for tiny tummies.” With no added sweetener, and enhanced with vitamin D and probiotics, this non GMO-certified yogurt comes in four varieties. They are: Banana & Sweet Potato, Blueberry, Peach & Mango and Plain. 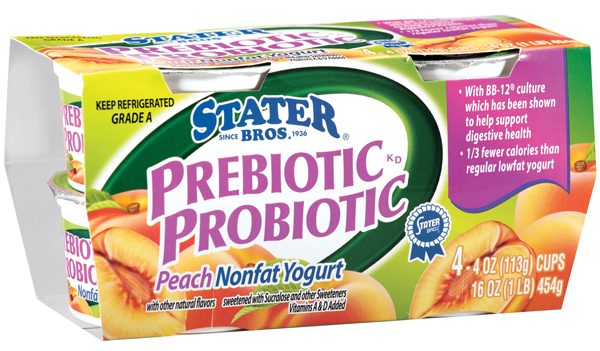 The yogurt comes in six packs of 1.76-ounce containers. 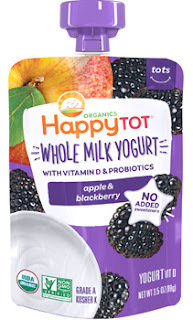 There’s also new Happy Tot Whole Milk Yogurt in 4-ounce cups and 3.5-ounce pouches. The cups come in six packs and the pouches in boxes of four. The tot line, designed for toddlers up to three years old, is also void of added sweetener and is enhanced with vitamin D and probiotics. The cups come in Apple & Pear; Apple, Mango & Carrot; and Strawberry, Banana, Oats & Chia varieties. The three pouch flavors are: Apple & Blackberry; Banana, Mango & Spinach; and Strawberry, Banana, Oats & Chia. General Mills is following suit. 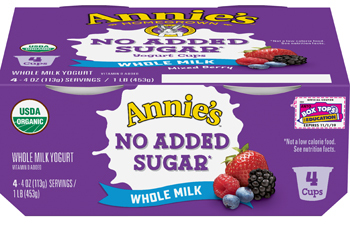 The company will soon be rolling out Annie’s Homegrown No Sugar Added Whole Milk Yogurt in pouches. Varieties are: Banana, Blueberry Avocado; Mango Sweet Potato; Peach Pumpkin; and Raspberry, Strawberry Spinach. Icelandic Provisions, which sweetens its skyr with just a “little bit” of cane sugar, proudly boasts sugar content on front panels of its newly redesigned package. 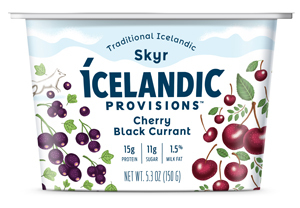 The company has the tagline of “rich in culture, not in sugar.” This month the company is rolling out a Cherry Black Currant variety, which was crafted in partnership with Chef Gunnar Gislason, one of Iceland’s most acclaimed chefs and a pioneer ushering in the Nordic food movement in the U.S. The new flavor combines naturally sweet ripe black cherries with the tart punch of black currant, both of which are commonly found throughout the Nordics. “Eating skyr with ripe berries is a tradition in Iceland that goes back centuries. For this flavor, we wanted to craft a cherry that was more complex than what Americans currently have access to and pay homage to that Nordic food tradition of being playful in ingredient pairings,” says Chef Gunnar regarding how the flavor was approached. Here’s what formulators need to address when reducing or eliminating added sugars in dairy foods. 1) If fruit is part of the product, a higher brix, more premium fruit may be necessary. This will deliver extra natural sweetness to the product. 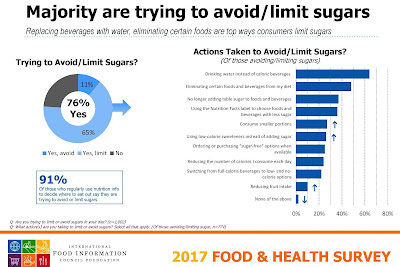 2) When you are removing or reducing added sugar, you are decreasing solids. Something needs to be added to replace the bulk in order to maintain desirable texture, mouthfeel and product consistency through shelf life. Clean-label options include everything from organic tapioca starch (used in many of the baby and tot products because tapioca is easy on sensitive tummies) to pectin and locust bean gum. Various fibers are also an option, with some adding natural sweetness. 3) In frozen desserts, sugar impacts freezing temperature of the mix. Extra stabilization is required when sugar is reduced or removed. Protein helps. That’s the secret to the low-sugar, high-protein frozen dairy desserts in the market. 4) Lastly, a little all-natural, high-intensity stevia sweetener may just be what the formulation requires to meet the sweet threshold of today’s consumers. Don’t be afraid to try the next-generation of stevia ingredients in the market. Commit to reducing the sugar content of your dairy products in 2018! Hope to see you in less than two weeks at either Fancy Food in San Fran or Dairy Forum in Palm Springs! Love. Peace. Hope. My personal mantra for 2018. Professionally, let’s commit to make 2018 dairy’s best year ever by working together to promote dairy’s deliciousness, wholesomeness and nutritional superiority. Let’s never forget that when the dairy industry works together we become stronger and have a more believable message. Competition keeps us motivated. It’s time to embrace the current food and beverage landscape with a unified positive dairy message. Here are five suggestions to include in your innovation and marketing plans of dairy foods this coming year. 1. Qualify the protein. It’s time to not just flag protein content but flag that it's dairy/milk/whey protein. Talk about the quality and complete amino acid profile. Why? Well, I have to say, watch what you ask for. Many non-dairy/dairy alternative/nut juice product marketers are no longer using the word milk on their products because they’ve discovered more powerful words: plant based. The Specialty Food Association’s Trendspotter Panel identified plant-based foods as the hottest food trend in 2018. Consumers have been hearing and reading nutritional advice to have a more plant based diet, and as a result shoppers are gravitating to alternative dairy products because they are “plant based.” Let’s not waste time trying to dispute this message, rather, let’s explain why dairy protein is superior to plant protein. MOPRO Nutrition does a great job of doing this. This cultured dairy product, which is making its debut in a vanilla flavor, is made with only six ingredients. They are: whole milk, whey protein isolate, soy lecithin, organic blue agave syrup, vanilla extract, and live and active cultures, including probiotics. 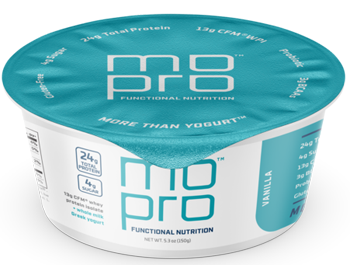 A 5.3-ounce cup contains 24 grams of total protein. The majority (13 grams) of this comes from cross-flow microfiltration (CFM) whey protein isolate. The other 11 grams is inherent to the yogurt. CFM is a proprietary membrane technique used to yield a highly pure, nutritionally superior and undenatured whey protein isolate. Each container also has 3 grams of branched-chain amino acids (BCAAs), which are essential nutrients that the body obtains from proteins found in food, especially meat, dairy products and legumes. They include leucine, isoleucine and valine. “Branched-chain” refers to the chemical structure of these amino acids. There is research that indicates BCAAs promote muscle synthesis and increase muscle growth over time as well as help with fatigue from athletic training. 2. Probiotics and prebiotics need to take center stage. 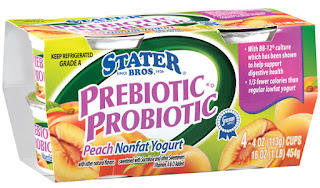 Consumers historically have associated probiotics with yogurt and other fermented dairy foods. This has evolved over the past decade as scientists gained a better understanding of how these microorganisms survive, thrive and exert health benefits on the host. Researchers also continue to learn how prebiotics, which are fuel for probiotics, selectively influence probiotic activity in the gut. Together, probiotics and prebiotics are recognized as a natural solution for overall wellness, as research suggests the gastrointestinal system is at the center of metabolic health and disease prevention. Roughly a quarter of U.S. adults seek out foods and beverages with high amounts of probiotics or prebiotics, according to a 2017 national consumer survey conducted by Packaged Facts, Rockville, Md. This interest is motivating innovation in the food and beverage industry. From April 2016 to April 2017, nearly 2% of new food and beverage products globally contained probiotics, rising to 3% in the U.S. market, according to Innova Market Insights. The number of probiotic product introductions globally grew from less than 100 in 2002 to nearly 1,800 in 2016, with U.S. by far the leading market, followed by the U.K. and Canada. Cup yogurt, drinkable yogurt and similar beverages, infant products, and sports powders are the top probiotic food and beverage categories globally. It’s time to better market the inclusion of probiotics and prebiotics in dairy foods. Those plant-based food and beverage marketers are doing it. To read more about next-generation probiotics and prebiotics, link HERE to a special report I recently wrote for Food Business News. 3. Make dairy foods more accessible. Fruit and granola parfaits at Starbucks and single-serve bottles of milk at McDonald’s are not enough. It’s time to brainstorm with local retailers and foodservice operators to identify ways to make dairy foods more accessible. The plant people are doing it. Just this week I received a press release from Interstate Hotels & Resorts, a leading global hotel management company, about the launch of 27 new vegetarian and vegan culinary menu items for its managed hotels. I bet these travelers would buy more dairy-based snack and on-the-go foods if they were made accessible. 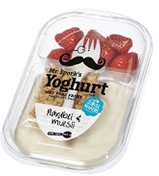 The assortment consists of three products: quark-creme, classic rice pudding and skyr. Each Milram-branded 185-gram clear plastic cup is filled half way with one of the products. The cups are sealed to maintain freshness for about three-weeks. Retailers, or foodservice operators, receive the sealed cups, along with dome lids and sealing tape, so they can turn the product into fresh parfaits with fruits, nuts, granola, etc., on an as-needed basis. This decreases waste in terms of on-site scooping of product into cups as well as reduced shelf life because of opened perishability. My Dutch friends at De Zuivelmakers (Hi Niels!) have been very aggressive in their efforts to offer fresh dairy to on-the-go consumers. Congrats. Most recently they debuted a yogurt bar concept, which is now in more than 150 stores--both foodservice and retail--around the Benelux. This VIDEO shows you what the yogurt bar is all about. 4. Be transparent in your process. I just submitted a beverages trends special report to Food Business News. It publishes next week. When conducting my research, numerous beverage processors emphasized that consumers want transparency in their beverage brands. They want clean label with minimal ingredients, and minimal processing is also being marketed to the consumer. Think “cold brew,” “cold press” and “high-pressure processing.” One juice beverage marketer said that 2018 will be the year that the relevancy of processing becomes mainstream. Consumers increasingly want full disclosure regarding food additives, including source and function, as well as how a product is made. Think about Greek yogurt. This is something we missed when trying to figure out what made Greek yogurt such a game changer. Yes, it’s higher in protein. Yes, it tastes different. Yes, it has a different texture and mouthfeel than mainstream yogurt. And YES: authentically produced Greek yogurt is made using a more hands-on approach, a different process. Consumers were as fascinated about the product as the straining process. They likely imagined Greek dairymen standing around a strainer watching the product thicken for hours at a time. In 2018, commit to clean label and clean process. The two are the perfect marriage. And the dairy industry is well poised to be a leader in the clean-food movement. Today’s shoppers want to understand how their food was made. Tell them. Engage them. 5. Protect your product. Part of that transparency in ingredients and process includes the steps you take to ensure food safety. Further, new portable formats require special attention to food safety, as exposure to the elements exposes product to contamination. Protect. Promote. Protein. Probiotics. Portability.